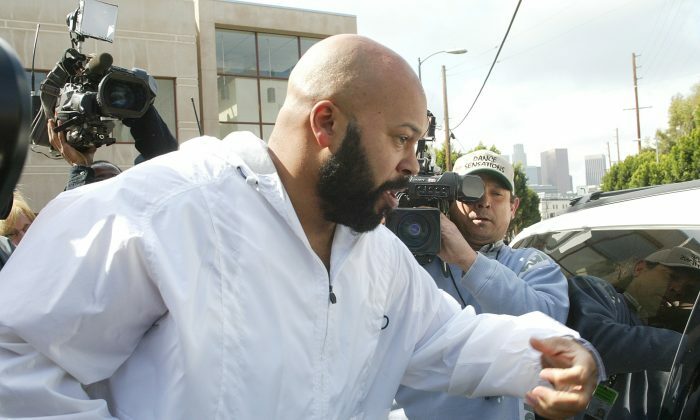 Rap Mogul Marion “Suge” Knight, the former CEO of Death Row Records was charged with murder Friday in an alleged hit and run, according to Fox News. He is being held on a $2 million bail. The Los Angeles County Sheriff’s office said the former rap mogul was arrested at about 3 a.m. and was being held at the West Hollywood sheriff’s station. The Los Angeles Times reported that Knight turned himself in early Friday and he was accompanied by his attorney, James Blatt. “We are confident that once the investigation is completed, he will be totally exonerated,” Blatt told the Associated Press by phone. Reportedly, Knight was driving a red pickup truck that struck two men in Compton, Calif., but there is no identifying information about either man. The injured man is being treated at a hospital. The Sheriff’s Department Capt. John Corina said based on witness accounts, it was an intentional act. A Department representative said the incident stemmed from an argument on the film set of an upcoming film called Straight Outta Compton. The two men Knight argued with went to a nearby restaurant about 20 minutes after the altercation. According to Corina, Knight ran over the two men in the parking lot of the restaurant after following them in his red truck. Witnesses say they saw the truck hit the men then back up over them. Since 1996, Knight has been in and out of prison a numerous times. Knight’s attorney is calling it an accident, saying Knight ran over a friend, killing him, and injuring another man, while fleeing attackers. “He was in the process of being physically assaulted by two men and in an effort to escape he unfortunately hit two (other) individuals,” Blatt said. Since 1996, Knight has been in and out of prison a numerous times, including for probation violations. He was arrested in 2008 on drug and aggravated assault charges. In 2012, Knight was arrested in Las Vegas after police found marijuana in his vehicle. Knight was shot in 2005 at a Kanye West-hosted party in Miami. Police found the empty pickup truck in a West Los Angeles parking lot, according to Corina.